Hans Bacher is a veteran production designer with more than four decades of experience in the animation film industry. He has worked on Disney classics such as Lion King, Mulan, Aladdin and many other films. Needless to say, he's a legend. His first book Dream Worlds: Production Design for Animation is what I would considered an essential book for anyone who wants to work in the animation or film industry. This new book is also pretty much a must-buy. 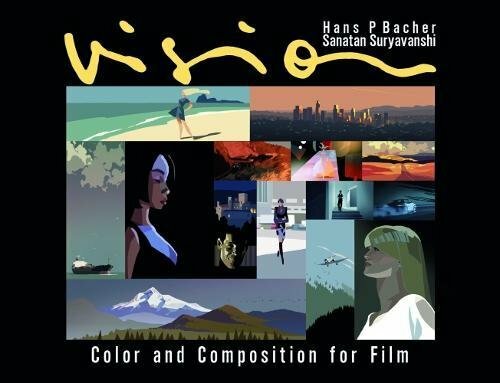 This book talks about the concept of color and composition and how you can use them effectively in film. The focus is about seeing and thinking like a visual storyteller, on how you can best use visual design to bring across a message without saying anything. It's about making images that evoke or create memories, and hence bring forth emotions from the viewer. This 240-page hardcover is filled with lots of examples and explanation. You may have seen some of the concepts in books on graphic design or art foundations, but here those concepts are applied to film making. The book talks about psychology of images, the use of visual elements such as line, shape, value, colour, light and composition. And since this book focuses on animation and film, it also covers camera shorts, e.g. framing, zoom, movement. The text is concise, clear and packed with so much useful information that one probably needs to read the book several times to have all the concepts sink in and stick. This is a book that I will definitely revisit often. This is a tremendous resource that's now available for the price of a book. It's a fantastic deal. This is definitely one of 2018's best artbooks for me. Most highly recommended. If you don't have Dream Worlds, do yourself a favour and get that book too. i have this one preordered from amazon since… december last year i believe. i’m counting the days already. I have now this two books in front of me. They are amazing. Thank you for the review! I'm excited to read my copy now! I am curious though - what are the differences between this book and Dream Worlds? There are more examples, tips and techniques in the Dream Worlds.